On this tab you can setup a work mode for EurekaLog Viewer. See DB mode vs View mode to get detailed description of work modes. This page setup default work mode for the Viewer (i.e. mode, when you simply run EurekaLog Viewer). Note, that you can select a special mode manually - by using command line switches or selecting a special action command. This is simple view mode. In this mode EurekaLog Viewer works as viewer only. I.e. there is no import command. Once you open a new file - report's list will be cleared and filled from file. In this mode report's list can automatically hide if there is only one report in file (some bug report file formats can contain more than one report). This is mode from EurekaLog Viewer v2. All other modes are database modes. See DB mode vs View mode to get detailed description of work modes. This is special database mode, which do not save any data to disk. I.e. there is import command, but once you close the Viewer - the "database" will be cleared and will be empty on the next run. It is useful if you want to have multiple reports in one window, but do not want any database features. This mode will be automatically used if you force-use "import" command (for example, via command-line switches or right-clicking on bug report file) but database is not configured. Database in this mode is stored in usual elf-file, which usually has "dat" file extension. Database's file can be stored on network path, but it is really better to use remote FireBird server in this case. This is mode from EurekaLog Viewer v3. Database in this mode is stored in FireBird database either on local file or on local/remote FireBird's server. You should either leave the "Server name" field empty and specify a FireBird file on your machine (you can use "..." button for this task) OR you should set it to some string (machine's name or IP) to have database on remote server. The "Login" and "Password" fields are the account params for the database itself. I.e. it is real FireBird's database account, which you can set or change by using any FireBird database management tool. This account differs from EurekaLog's account in database, which you can manage by using Viewer itself. This is new mode for EurekaLog Viewer from EurekaLog 7. This is the only database mode, which supports user's accounts (for EurekaLog Viewer from EurekaLog 7). Note, that for working on local file ("Server name" field is empty) EurekaLog Viewer uses embedded FireBird server, which doesn't support security database (refer to FireBird documentation for more information). See also: default database's parameters. This button is available for file-based and FireBird database modes. 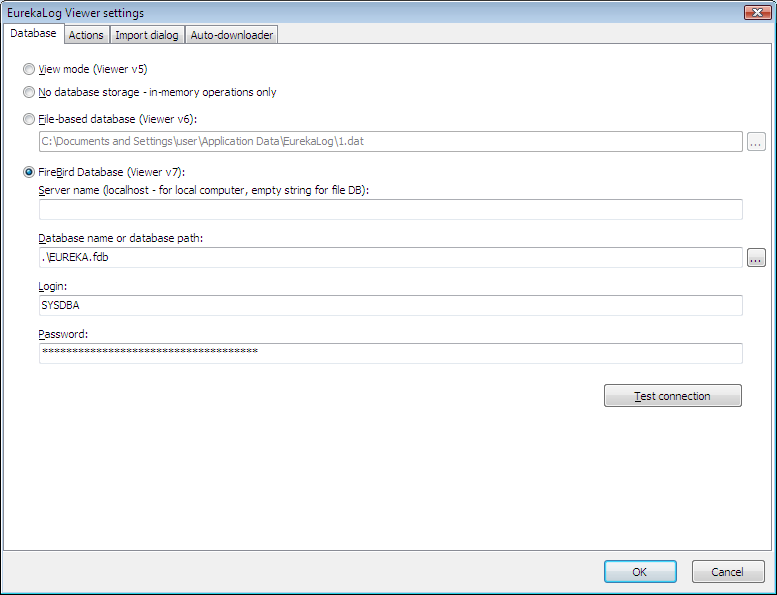 You can use it to check database availability before saving changes. Note that if you use "Test connection" button on database, that is already in use by Viewer right now, you may get an error message as Viewer can not receive access to database's file.